Is Tinder for married people, you think to yourself, staring up at the flickering shadow of the ceiling fan while hubby is snoring next to you. It has been many sleepless early mornings lately, after going to bed tense with the vibrating energy of unspoken words filling the air. You hide behind the smoking coffee cup and do a quick google search at the breakfast table. «Good morning, honey», you say with a smile while scrolling through the top ten search hits. “4 in 10 Tinder users are already taken”. Your throat tightens, spilling coffee over your windpipe and forcing a deep and heavy cough. Fresh brew covers the smartphone screen. Hot, dark liquid runs down your wrist in abstract henna patterns. Your partner hands you a napkin, «Mornin’. You feelin’ alright?». «Yes, of course», you answer, double clicking the home button and pressing the news app in a hurry. «I was just reading that … I was just reading about this horrible election process.You heard about th…», you add, fully aware that politics is the last thing your partner wants to start the day with. «I don’t understand why you fill your head with that crap», he cuts you off. «I know, I know, it’s just hard to avoid sometimes», you answer and put your phone on the table, screen facing up, hoping your partner will catch the signal. Nothing out of the ordinary going on here. A new mantra is echoing inside your amphitheater, narrowing your eyebrows and claiming all your attention on the way to work. Is Tinder for married affairs? 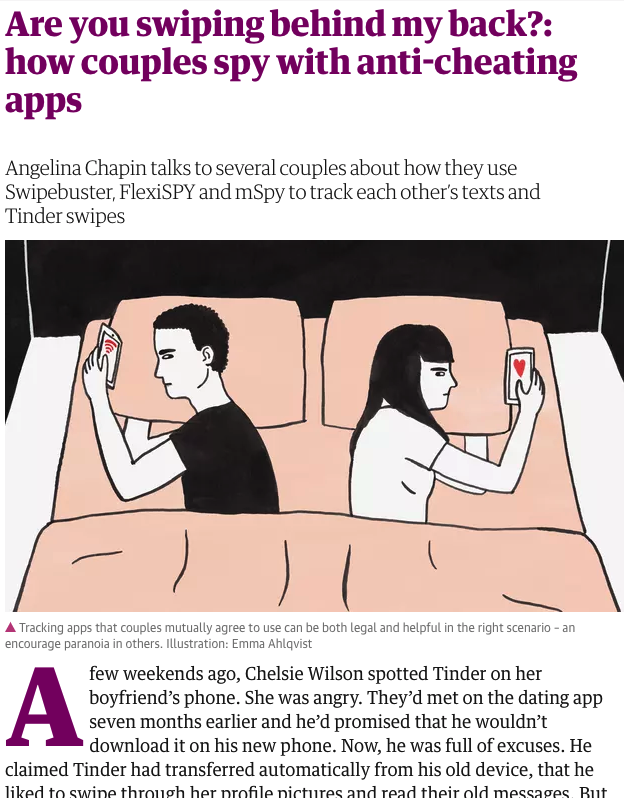 Is my partner having a Tinder affair? You keep a tab open in your browser while answering emails. It’s a busy day at the office. Tuesday is playing catch-up with all the promises made during Monday meetings. You are more indifferent than normal. Stopping by the open tab after each mail is sent. The pauses grow longer, digging deeper. You read articles about how to catch cheating girlfriends. About men’s cheating habits. About Tinder for married people. Tinder for married men. With each new headline unveiling a bigger and more common phenomenon than you have previously allowed yourself to think. Curiousness and an unsettling feeling from the past few months of increasing distance at home is clouding the empty the living room. Your partner is coming home late. As it has been for weeks now. There’s nothing to put your finger on, nothing concrete to confirm your growing unrest. But you understand now that cheating can be done very secretively, and there is a world out there where people advertise themselves for these exact purposes. It’s feeling obvious to you now, how to use Tinder when you are married. A digital meat market. No questions asked. Tinder for married guys is like a weekend of partying without the hangover. You never imagined your partner being able to keep a relationship on the side, but now that you are realizing how unbelievably easy it is to jump from one carefree and uncompromising adventure to the next, you’re not so sure anymore. Anyone could fall into that pool of temptation given the right push. And there has been some pushing and pulling around the house. A lot has been discussed in silence and empty stares and shrugging shoulders saying I don’t care. It didn’t take you long to grasp how to have an affair on Tinder. How commercialized and logical it seemed. A transaction. Tinder and married. And there is even a vast selection of married women on Tinder. You need to know now. You have to know. But you don’t want to make your partner suspicious. It would be devastating if you are wrong. If you are caught spying or digging for clues of adultery. That is not an option. You need an anonymous and fast way to clear your anxious mind. Or to confirm your worst fear. Either way you don’t want to carry this feeling of turmoil around. So you use Cheaterbuster, formerly Swipe buster. An online search engine that will give you all the answers you need within minutes. Step one: Start the tinder search by name. You must provide the exact first name as it appears on facebook of the one the person you are searching for. Step two: You must provide the age of the person. If you happen to be insecure of the exact age, you can write your closest guess. Step three: Use the map and provide the last location you believe the person used tinder. Step four: Enter your email to receive the tinder profile search results from Cheaterbuster (fka swipebuster). Based on the users search criteria and a number of other variables, results are typically delivered within three minutes. For 8 bucks and five minutes effort you can buy yourself some peace of mind.